The results are in. Lil Rounds and Anoop Desai were sent back home last night. They had a long ride but it’s the end of the road for them. Because the judges ‘saved’ Matt Giraud the week before this week was a double elimination week. For some odd reason everybody seemed to expect Lil Rounds to go home. Maybe it was because Simon Cowell said he wouldn’t have considered saving her had she been the one on the chopping block last week? Or maybe it was because the people of Votefortheworst had chose her as their pick of ‘worster’ to vote for? Or maybe it’s because she was this season’s Lakisha Jones and the judges just couldn’t stand her anymore after considering her to be one of the front runners? Everybody knew Lil didn’t have much time left in this show. Personally I feel that if they had let Matt go home last week she could have had a chance. In fact, it seems to me nobody expected Anoop Desai to make it through, his elimination was expected. Again, it seems that week after week no single contestant gets to be super safe anymore. It’s definitely nothing like what we saw last year where it was clear early one that the two Davids, Archuleta and Cook would make it to the finals. This year people were talking about a Adam Lambert / Danny Gokey final but now what we’re seeing is that it’s not guaranteed because for some odd reason those do can no longer separate themselves clearly from the rest of the pack in terms of votes. Meanwhile Kris Allen has been growing his fanbase steadily and so has Allison Iraheta. How many times has Kris been in the bottom three? 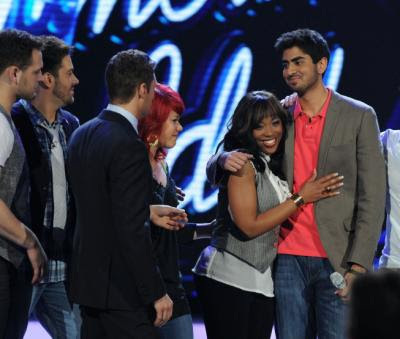 American Idol season 8 should be remembered as the Matt Giraud show or “How you to can very far in this competition if the judges really like you”. That’s right, we need to remember that Matt made it to the top thirteen because he was picked by the judges after the wildcard round, so was Anoop by the way. When America wasn’t convinced that Matt needed to stay any longer and voted him off the judges thought they should give him a third chance and ‘save’ him. Just take a moment to think about the other contestants who made it this far thanks to America’s votes alone. Hopefully the judges no longer have to power to impose their veto on the outcome of the eliminations at this point.